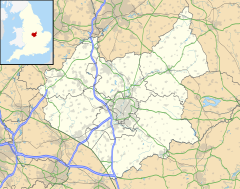 Ashby-de-la-Zouch (/ˌæʃbi dələ ˈzuːʃ/), often shortened to Ashby, is an English market town and civil parish in North West Leicestershire, close to the Derbyshire border. It is twinned with Pithiviers in north-central France. Its 2001 census population of 11,410 increased to 12,370 in 2011. Ashby-de-la-Zouch Castle had importance in the 15th–17th centuries. In the 19th century the town's main industries were ribbon manufacture, coal mining, and brickmaking. It was served by the Leicester–Burton upon Trent line of the Midland Railway from 1849. The civil parish includes the hamlets of Shellbrook to the west and Boundary to the north-west. Nearby villages include Lount, Normanton le Heath, Smisby, Packington, Donisthorpe, Oakthorpe, Moira, Measham and Coleorton. Swadlincote, Burton-upon-Trent, Melbourne and Coalville are within 10 miles (16 km), with Derby 11 1⁄2 miles (19 km) due north. Ashby lies at the heart of The National Forest, about 24 miles (39 km) south of the Peak District National Park, on the A42 between Tamworth and Nottingham. The town was known as Ashby in 1086. This is a word of Anglo-Danish origin, meaning "Ash-tree farm" or "Ash-tree settlement". The Norman French name extension dates from the years after the Norman conquest of England, when Ashby became a possession of the La Zouche family during the reign of Henry III. Ashby-de-la-Zouch Castle was built in the 12th century. The town and castle came into the possession of the Hastings family in 1464 and William Hastings, 1st Baron Hastings enhanced its fortifications from 1473. In the English Civil War, the town was one of the Cavaliers' chief garrisons under the control of Colonel Henry Hastings, 1st Baron Loughborough and commander of the North Midlands Army. When the town fell after a long siege in March 1646, it was counted a great relief to the surrounding towns and villages. Many of the buildings in Market Street, the town's main thoroughfare, are timber framed. Most of this structure is hidden by later brick facades. The Bull's Head public house retains its original Elizabethan half-timbering, although most of this was plastered over some years ago and can no longer be seen from the street. A short distance further down Market Street is a shop, currently occupied as a LOROS Charity Shop, which retains its original Elizabethan timbers in full street view. Regency buildings are also standing in this street. Bath Street has a row of Classical-style houses called Rawdon Terrace, dating from the time of the 1820s, when the town was a spa destination. The local upper school, Ashby School, previously Ashby Grammar School, is a mixed comprehensive school for 14–18-year-olds. It was founded in 1567. The town formerly had two other endowed boys' schools founded in the 18th century. A local high school, Ivanhoe College, for 11 to 14-year-olds, is named after the historical novel Ivanhoe by Sir Walter Scott, which he set in the area of the castle. In Scott's novel the town hosts an important archery competition held by Prince John, in which Robin Hood competes and wins. Manor House School was an independent day school in the centre of Ashby for boys and girls aged four to 16. The school was located between St Helen's Church and the ruins of Ashby's historic castle. Pupils travelled to the school from a wide geographical area. The school entered into administration on 13th December 2018. St Helen's Church is Ashby's original Anglican parish church. It is a late 15th-century Perpendicular Gothic building. The outer aisles were designed by J. P. St. Aubyn and added in 1878. St. Helen's contains notable memorials to various members of the Hastings family and other notables. It also holds a rare 300-year-old finger pillory, which may have been used to punish people misbehaving in church. Holy Trinity Church is a Gothic Revival building designed by H. I. Stevens in the Early English Gothic style and built in 1838–40. It has galleries supported by iron columns. The chancel was added in 1866 and the ironwork chancel screen in 1891. The Roman Catholic Church of Our Lady of Lourdes was designed by F. A. Walters and built in 1908–15 at the expense of the 15th Duke of Norfolk. It is neo-Norman, with three apses and a tower at the southeast corner. The Congregational Church was built in 1825 in a neoclassical style with Tuscan columns. The Methodist Church was built in 1867–68 in a Gothic Revival style. There is also a Christadelphian meeting hall in the town. The Grade II listed, 19th-century water tower, located in the town's cemetery on Moira Road, has been converted into a dwelling. The conversion was controversial since it involved a number of modern additions to the building. Edith Rawdon-Hastings, 10th Countess of Loudoun, widowed husband (Baron Donington) had the Loudoun monument erected in Ashby. The octagonal monument by Sir George Gilbert Scott is based on the Eleanor crosses and is a Listed building. In the 19th century Ashby's main industry was leather working. There was also a cotton textile factory and a glue factory. Ashby was surrounded by coalmines but was never a coal mining town itself. By far the largest employer in the town today is United Biscuits, providing about 2,000 jobs at its distribution centre, which stores its products and transports them nationwide, and its KP Snacks factory in Smisby Road. Its products include Hula Hoops, Skips, Nik Naks, Space Raiders, and Choc Dips. The firm formerly had a larger presence in Ashby. McVitie's biscuit factory on Smisby Road closed in 2004 with the loss of 900 jobs. Other employers in Ashby include Tesco, Ashfield Commercial & Medical Services, Timeline Communications, Eduteq Limited and TAC UK Ltd, a firm of energy consultants. Standard Soap Ltd., a significant industrial employer within Ashby de la Zouch since 1928, closed in early 2012, resulting in the loss of 155 jobs. The city has a concentration of high-tech employers. The video game software house Ultimate Play the Game, was based in Ashby. Now called Rare, it has moved to Manor Park near Twycross. The UK government's swine flu help-line centre for England was based at Ashby. Willesley Park Golf Course is set in rolling countryside, partly in parkland and partly on heathland, covering 230 acres of gentle undulating countryside. The course was opened for play in April 1921. The first hole is played along an avenue of lime trees which once flanked the old coach road from the old Norman castle in the town to the now demolished Willesley Hall. Ashby Hastings Cricket Club was founded before 1831. Its ground, the Bath Grounds in the centre of Ashby, hosts Leicestershire CCC 2nd XI matches each year. The club runs three Saturday League sides, all of which play in the Everard's Leicestershire County Cricket League. The 1st XI play in the Premier Division, the highest level of club cricket available in Leicestershire, the 2nd XI play in Division 4 and the 3rd XI play in Division 8. The club also run a Midweek XI who play in the Premier Division of the Loughborough Cricket Association League and a Sunday XI who play friendly cricket. The club's Junior Section includes sides at Under 15, Under 13, Under 11 and Under 10 age groups. A second club, Ashby Town Cricket Club was formed in 1945. Ashby RFC has its grounds in Nottingham Road. It plays in the League Midland 3 East (North). It also has mini and junior sections for girls and boys from age four, as well as seniors and seconds side and an O2 Touch team for players of all ages and both genders. The town was to be served by Ashby Canal from 1804 but the canal never reached Ashby, as it was constructed only to the town of Moira. Ashby had a station on the Leicester to Burton upon Trent Line of the Midland Railway from 1845. After the canal was abandoned in stages between 1944 and 1966, British Railways withdrew the passenger service and closed Ashby de la Zouch railway station in September 1964. The railway remains open for freight. In the 1990s BR planned to restore passenger services between Leicester and Burton as the second phase of its Ivanhoe Line project. However, after the privatisation of British Rail in 1995, this phase of the project was shelved. In 2009 the Association of Train Operating Companies published a £49 million proposal to restore passenger services to the line, which would include reopening a station at Ashby. The restoration of passenger train services remains part of Leicestershire County Council's Structure Plan as a project awaiting funding. The nearest railway station is Burton-on-Trent, 8 miles (13 km) away. The fastest train to London in the mornings and evenings is the Virgin Trains service from Tamworth (12 miles from Ashby) to Euston at 1hr 2mins average non-stop at peak hours. The A50 Leicester to Stoke-on-Trent road and the A453 Birmingham to Nottingham road used to pass through the town centre. The heavy traffic, which previously travelled through the town, has been greatly relieved by the A42 and A511 bypasses, which replace the A453 and A50, respectively. Bus routes provide an hourly direct service to Coalville and Burton-upon-Trent (Arriva Midlands 3, 9/9A & 16). The National Express coach network is available in Leicester, which has a daily direct service to London. East Midlands Airport is 9 miles (14 km) north-east of Ashby. It provides flights to and from other parts of the UK and Europe. For International travellers Birmingham Airport is 26 miles away (approx 30 mins) and provides international connections to the world with many via Schiphol via KLM/Air France/Lufthansa. Every May, Ashby holds an arts festival sponsored by the district council. This features local artists, musicians, songwriters, poets, performers, and story tellers. The multiple sites around the town host exhibitions, musical performances, workshops and talks, and the town centre is decorated with flags and an outdoor gallery. Ashby Statutes, a travelling funfair, is held every September. Instituted by Royal Statute, it was originally a hiring fair, where domestic servants and farmworkers would be hired for the year. During the fair in the 21st century, Market Street, the main road through the town (the former A50 trunk road), is closed for nearly a week. The traffic is diverted along narrower roads either side of Market Street. Locals call this event "The Statutes". A song "Ashby de la Zouch (Castle Abbey)", written by Al Hoffman, Milton Drake and Jerry Livingston, was recorded by the Merry Macs in 1946 on Decca No. 18811. It includes the lines "If you wanna smooch and be happy as a pooch, go to Ashby de la Zouch by the sea." (Ashby-de-la-Zouch is close to the centre of England, almost as far from the sea as is possible.) In April 1946 the American jazz bassist and composer Charles Mingus recorded a tune called "Ashby de la Zouch" with his band. The title or choice of song could have been an acknowledgement of guitarist Irving Ashby, who took part in the recording. Mark Chadbourn (born 1960), author and screenwriter, was born in Ashby-de-la-Zouch Cottage Hospital and still lives in the area. James Green (born 1944), crime and non-fiction author, lived in the area in the 1970s and 1980s. Joseph Hall (1574–1656), satirist and bishop, was born in Ashby-de-la-Zouch. Russell Hoult (born 1972), footballer, was born in Ashby and still lives locally (at Coleorton). Lara Jones (1975–2010), children's author, was born in Ashby. Caleb Shomo (born 1992), musician, lived in Ashby with close friend Henry Dartnall for three years while writing the first Beartooth (band) album. Max Rushden (born 18 April 1979), radio presenter, went to school Ashby Grammar School between 1994 and 1996. Niall Mackenzie (born 1961), Grand Prix motorcycle racer, is now retired in Ashby. Dolly Shepherd (1887–1983), aviator, made her return to parachuting from balloons in a display at Ashby, after recovering from a near-fatal accident. Paul Taylor (born 1964), England cricketer, was born in the town. Alastair Yates (living), former presenter on BBC News and BBC World News, went to Manor House School, Ashby; his farming family still live in the town. Adrian Mole, a fictional diarist created by writer Sue Townsend, was from Leicester and moved to Ashby-de-la-Zouch during his lifetime. His girlfriend Pandora Braithwaite later becomes MP for the town. Townsend was invited to open the new English building at Ashby School in 2007. ^ "Area selected: North West Leicestershire (Non-Metropolitan District)". Neighbourhood Statistics: Full Dataset View. Office for National Statistics. Retrieved 17 July 2011. ^ Wells, John (3 Apr 2008). Longman Pronunciation Dictionary. Pearson Longman. p. 47. ISBN 1405881186. ^ "Town population 2011". Neighbourhood Statistics. Office for National Statistics. Retrieved 5 June 2016. ^ Scott, W (1907). The Story of Ashby de la Zouch. London and New York: White Lion Publishers. p. 245. ^ Watts, Victor; Insley, John; Gelling, Margaret, eds. (2004). The Cambridge Dictionary of Place Names. Cambridge: Cambridge University Press. p. not cited. ISBN 0-521-36209-1. ^ "The Ashby Garrison In The Civil War". www.localhistories.org. Retrieved 5 April 2018. ^ "Modern photograph of The Bulls Head". Ashby Museum website. Ashby Museum. Retrieved 13 July 2012. ^ "Photograph of 51 Market Street, Ashby de la Zouch". Ashby Museum website. Ashby de la Zouch Museum. Retrieved 13 July 2012. ^ "The Church in The Heart of Ashby". Ashby Christadelphians. ^ Pegden, Tom (2018-03-18). "Why historic county hotel has closed". leicestermercury. Retrieved 2018-03-18. ^ KATIE BOWLER (29 November 2012). "Thumbs-up for water tower housing plan". Burton Mail. ^ Stuff, Good. "Loudoun Monument, Ashby-de-la-Zouch, Leicestershire". britishlistedbuildings.co.uk. Retrieved 2018-10-08. ^ Annual and Transition Report, Foreign Private Issuer", SEC, 06 April 2005. Quote: "During 2003, we announced a proposal to close our biscuit factory at Ashby-de-la-Zouch by the end of 2004 to improve our factory utilization and enable us to effectively support growth in our priority brands. We transferred approximately one-third of production to other sites and completed the first phase of the redundancy program...During 2004...[we also completed the closure of our biscuit facility at Ashby-de-la-Zouch." ^ "Jobs lost as Standard Soap factory closes". BBC News. Retrieved 10 July 2016. ^ "Ashby Hastings Cricket Club". ahcc.co.uk. Retrieved 5 April 2018. ^ "AHCC Web Site". ahcc.co.uk. Retrieved 5 April 2018. ^ "Ashby Town Cricket Club". ashbycricket.co.uk. Retrieved 5 April 2018. ^ "Ashby Arts Festival". www.ashbyartsfestival.co.uk. Retrieved 10 July 2016. ^ ScrambledEggs1969 (4 October 2012). "The Merry Macs - Ashby de la Zouch By The Sea (Castle Abbey) 1946 Zooch". Retrieved 5 April 2018 – via YouTube. ^ "Notes & Queries: Which British town is furthest from the sea?". the Guardian. 25 April 2012. Retrieved 10 July 2016. Curtis, John (1831). A Topographical History of the County of Leicester. Ashby-de-la-Zouch: W. Hextall. pp. 4–6. Pevsner, Nikolaus (1960). Leicestershire and Rutland. The Buildings of England. Harmondsworth: Penguin Books. pp. 50–55. Wikimedia Commons has media related to Ashby-de-la-Zouch. Wikivoyage has a travel guide for Ashby-de-la-Zouch.